Over the past decade, the energy industry has been impacted by countless significant events. While some were the result of human forces and others were natural occurrences, in all cases they changed the way that the public perceives the companies in charge of extracting, producing, and distributing energy resources. During this decade, we’ve seen the largest-ever marine oil spill, the biggest power outage in U.S. history, and questions about nuclear safety post-Fukushima. We’ve seen activists seize control of our energy dialogues and turn the tide of public opinion on promising domestic energy sources. We’ve seen the impact that companies with only tangential intersections to the energy industry can have on the overall perceptions of the industry and its component sectors. And today, we are experiencing a major collapse in the price of oil due to many interrelated factors including the fracking revolution, reduced demand in Asia and Europe due to weakening economies and new efficiency innovations. In some cases, these sectors have suffered significant reputational and financial damage by events outside of their control. In collaboration with Tenet Partners, the leading brand measurement and valuation firm, we will dig into these trends and explore the factors that can impact the crude oil and petroleum refining segments of the energy industry. Our goal through this project is to understand the ways in which events can impact the “brand power” and short- and long-time influence of corporations and energy industry sectors. In so doing, we can better understand how industry can prepare and respond to events in ways that effectively mitigate the damage and preserve – or increase – their reputational assets. Each year, Tenet using CoreBrand Index® surveys 10,000 business decision makers from the top 20 percent of US businesses with annual sales above $50 million to arrive at scores for familiarity and favorability, which reflect company size/recognition and quality, respectively. 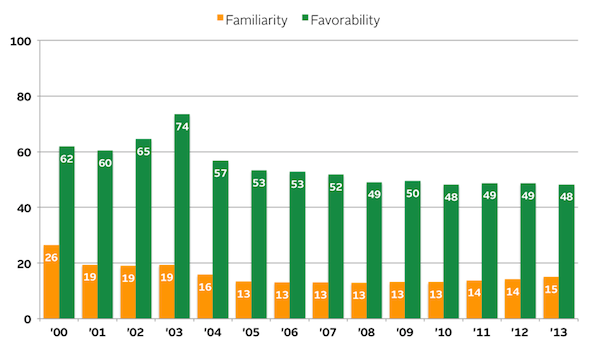 Familiarity represents a weighted percentage of survey respondents who recognize the brand being evaluated. 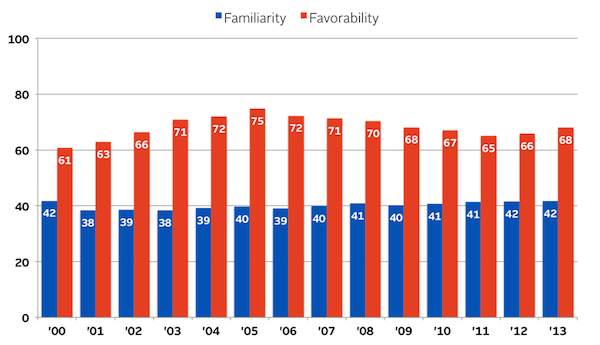 Only respondents who are familiar with a brand – knowing more than just the company name – are asked to rate the three dimensions of favorability on a four-point scale: overall reputation, perception of management and investment potential. Familiarity and favorability scores are then combined into a single BrandPower score and then used to calculate the brand equity value (BEV) – comprising BrandPower, familiarity and favorability – of each company, both as a dollar value and as a percentage of the company’s market cap. With data extending back to 1990, Tenet is able to measure changes in a company’s BEV from a specific event, such as a major oil spill or major regional power outages. This lets Tenet determine the magnitude of the impact the event has had on BEV, both as a dollar amount and as a percentage of market cap. For background on this project, including a summary of the methodology used to create the data, please see the Introduction to Energy Branding Trends. This is an illustrative case study of how different links in a supply chain can show startling differences in how they are influenced by given events over time – and how their brands and reputations are impacted. Sample companies in Crude Oil: Anadarko Petroleum, Apache Corporation, Baker Hughes, Canada Southern Petroleum, Enterprise Products, Halliburton. Sample companies in Petroleum Refining: Ashland, BP, Citgo Petroleum, Exxon Mobil, Hess, Murphy Oil, Occidental Petroleum, Royal Dutch Shell, Tesoro Corporation, Valero Energy. Since 2000, both the crude oil sector and the petroleum refining sector have seen wide fluctuations in price and other major news and political events. Consumers have been impacted more directly by price and market gyrations in these sectors as prices they pay at the pump, to heat their homes, and for many of their energy needs are subsequently affected. The corporate brands of both sectors – petroleum refining and crude oil – are highly sensitive to market conditions, price fluctuations and accidents, which make reputation management an important component of corporate governance. Understanding the long term trends of each segment of the industry combined with an individual company performance within an industry is fundamental to managing the impact of the brand on corporate enterprise value. Corporate communications officers can use this information in their long-term strategic planning as they look to develop communications and government affairs plans. Given the fluidity of consumer opinions in the crude oil and petroleum refining sectors, companies have to be more reactive in the short term to protect and promote their reputations. Failure to respond quickly to events – or significant delays in doing so – comes with a much steeper reputational cost. As a best practice, companies should adopt a long-term strategy to consistently increase their brand valuation year after year.